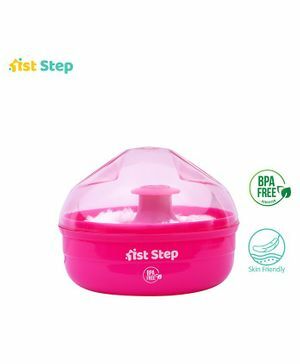 1st Step Baby Powder Puff is designed especially to provide your baby with a beautiful and fun experience as you dab the powder over their body. The soft and fluffy powder puff is for gentle touch. Just add some powder in the container and pat all over baby's skin. The powder spreads equally all over the body. Easy to use and carry in a diaper bag while traveling with the baby. cap is very loose . this is of no use. Puff is so soft and nice quality. Very bad quality dont buy ever guys ...waste of money ..